Audits: Learn how e-mail is used and operated within your company. Get your companys e-mail-usage rated against the best practices of the industry. Discover inefficiencies and risks. Consulting: Learn how to make e-mail-usage in your company more efficient, more professional and more secure. Learn eventually which alternative technologies may serve your purpose better than e-mail. Workshops: Get SofTust to facilitate workshops with your key decision-makers on e-mail. Use the workshops to get a common understanding of the team members or to get to certain decisions. E-Mail-Policies: Have an e-mail-policy written that meets your requirements - and that will be accepted by your employees. Product selection: Get support for the selection of those products, services or partners that will make your company's e-mail-usage better and more secure. Implementation: Have SofTrust support you in the roll-out of your e-mail-efficiency-campaign. Benefit from SofTrust’s tools as well as from the experience in communication and training. Coaching: Provide your senior management with a one-to-one coaching to make them more effective as leaders when using e-mail. SofTrust Consulting has developed a special coaching approach to qualify managers to be MbE-Managers (MbE = “Management by E-Mail”) and thus make their organizations more competitive. Training: Take advantage of SofTrust's training experience, be it in a classroom-setting, in town hall-settings or in a web-based-training environment. Get the message to your staff in the right way. Quality management: Have SofTrust survey whether e-mail-usage-standards and policies are kept. Avoid liabilities out of missing quality checks. Speaker service: Have SofTrust Consulting to speak on your conference, meetings, etc. Günter Weick, SofTrust’s frontman for email-efficiency and best-selling author, is one of the leading European speakers about email and e-communication. He is key-note speaker on these subjects and seeked after by media for interviews. 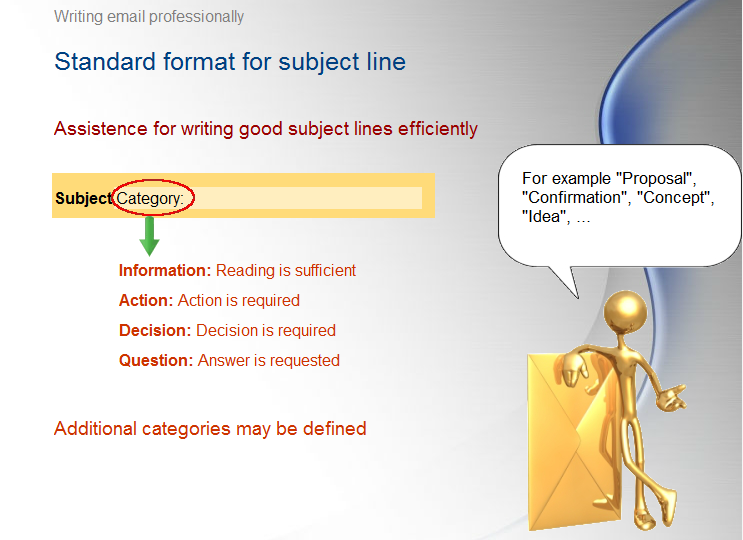 Do you want to learn how to use e-mail more efficiently? Without leaving your desk? Our webbased training course E-Mail-Star/WBT gives you subject-matters out of our renowned classroom-trainings. The only things you need for the complete course are about 2 hours time and a PC with a webbrowser and loudspeakers. Click here to learn more about the CBT-course and get a free demo. Utilize SofTrust's skills, tools and experience to make your e-communication-project a success.